Among the saints, the Virgin Mary occupies the first place and stands higher than all. Hymns, readings and praises ( the “Theodokia”s) for the Holy Virgin during liturgy, praises & naming a Church fasting to the LORD after her name. ✥ The“Yes” of the Mother of God. ✥ Mary as our faithful advocate and faithful intercessor. + In the Orthodox Church, Christology and Mariology are inseparable. + The insistence of the Orthodox Church on calling the Virgin “Theotokos” which means the Mother of God, or God-bearer underscores the fact that Christ is One of the Holy Trinity and not merely a man somehow joined to God. + Some suppose that the Virgin Mary was merely a passive “channel” through which God entered the world. Such a faulty assumption could threaten the reality of the humanity of our Lord Jesus Christ. + The Church insists that the Virgin Mary was the Mother of the Incarnate God in every sense of the word. + Man was created in the image of God. He was given the freedom either to realize his life as love and communion with God, or to deny his divine calling and enclose himself in the hell of self-love. + The coming of Christ was the fruit of a long, historical process. The Virgin Mary is the culmination of all that God has done through Israel to prepare the world for His coming. ✥ St. Mary as the second "Eve"
+ It is not accidental that we read in the Book of Genesis that Eve, not Adam, was the first to eat from the forbidden fruit. + The Virgin Mary's "Yes" is the answer to Eve's "No"
+ At the beginning and in the middle of history, there stand two women, Eve and Mary. Eve is the mother of fallen and sinning mankind. Mary is the mother of a new, reborn mankind which is being saved. In the first there was the cause of universal evil; in the second, the cause of universal good. + The Virgin is the historical foundation for our salvation, and fulfils the most basic purpose of humanity as a whole. + Our task is to strive to respond to God as the Virgin Mary did. + At the wedding of Cana, we clearly see that role of our Mother, the Virgin Mary. 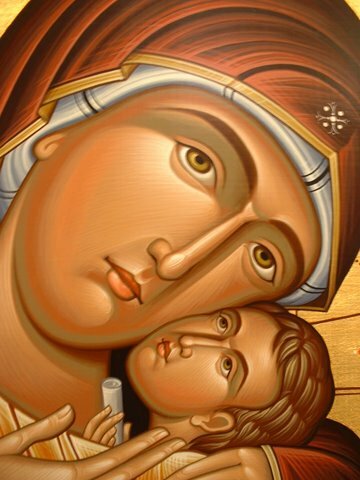 + For the first time we hear of an appeal for the needs of man from the lips of the Mother of God to her Divine Son. The kind hearted heart of the All-holy Virgin Mary, herself the representative of the race of man, intercedes; it brings the needs of people before the Savoir and calls Him to the work of salvation. + The Virgin Mary and the lives of some Popes. May the Intercessions of our Holy Mother, our faithful advocate and fervent intercessor Be with us all. AMEN.